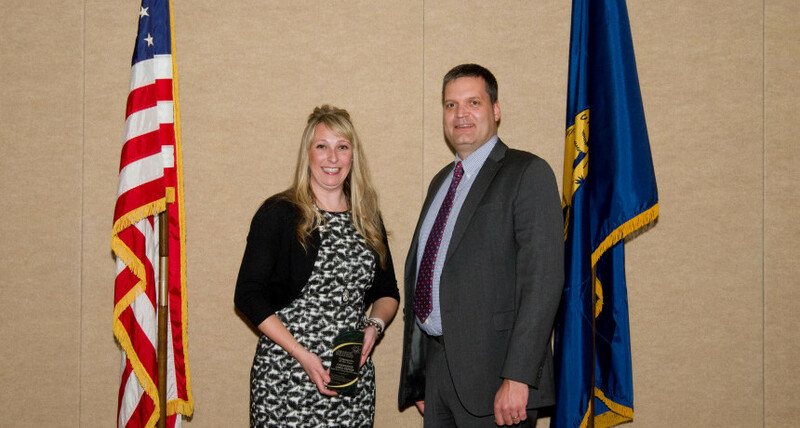 The Oregon State Sheriff's Association selected Jamie Hepner of the Hood River County Sheriff's Office as the Parole & Probation Commander of the Year. We are extremely proud of Jamie and all that she has done for the Sheriff's Office. Congrats, Jamie! "In July of 2014, the Hood River County Sheriff’s Office had the opportunity to integrate the previously autonomous Community Corrections office into the sheriff’s office, creating the Parole and Probation Division. The first task was to hire a commander to run the division. In June of 2014, Commander Jamie Hepner started as the office’s first parole and probation employee. In July, when all existing staff became HRCSO employees, Commander Hepner had to not only learn a new job, having worked for about a decade prior in Washington State, she had to train and mold the young staff into effective Parole and Probation Deputies. In the past 40 months, Jamie has transformed the P&P Division into a highly effective team that seamlessly integrated into the existing HRCSO system. In addition to creating a working environment that is recognized for its high level of morale and integrity, Jamie’s efforts have resulted in a division that is known for using programs and supervision techniques to assist clients, while reinforcing offender accountability. Throughout, Commander Hepner continues to share and reinforce the goals and values of the Hood River County Sheriff’s Office. In 2016, Jamie’s innovative ideas and investment of JRI funds resulted in contracts with a private hotelier to create a transitional housing resource; further, she solicited and contracted with a dual diagnosis provider bringing much needed in house alcohol and drug, as well as mental health treatment services to the office. Additionally, Jamie took on the task of piloting a program with the Telmate Guardian software that leverages technology to assist with monitoring specific clientele. Jamie’s efforts with the software have been featured on the Oregon Knowledge Bank and she had an opportunity to speak about the office’s experience with the product at last year’s American Parole and Probation Conference in Cleveland, OH."